Going into X-Men: First Class I was afraid that I might already be coming down with a bad case of sequelitis. It's way too early in the "Summer of Sequels and Superheroes" to be suffering the effects already, but The Hangover 2 was carrying a particularly virulent strain of said disease. On top of that, the last two X-men movies could best be described as "the exact opposite of 'good'". So there I sat in the darkened theatre brainstorming awesome titles to use in my review (such as X-Men: Economy Class), when the film started to roll. Suddenly something weird happened. I found myself totally engrossed in a really good movie. X-Men: First Class is a prequel of sorts, set back in the swinging sixties. The movie revolves around Charles Xavier (the man who would be Professor X), Erik Lehnsherr (the birth name of one Magneto), and the relationship between the two men. Charles is a well-educated man whose goal is to promote the good in mutants and nurture their acceptance into society. Erik is a bitter man, fueled by hatred and revenge, whose only goal is to harm those who first harmed him. He feels the only way for mutants to coexist with the "normies" is to stand up and take their place by any means necessary. Naturally these two men become fast friends. Together they seek out other mutants, nuture their natural powers, and teach them how to properly use them. When it is discovered a mutant is plotting to pour gas on the smoldering embers of the Cold War, it is up to Charles, Erik, and the Mutant Kid Team to save the day. What makes this movie work, above all else, is the attention paid to the characters. Although it is an epically proportioned special effects-driven movie, it is always grounded by these characters. This is also what has been missing from big budget movies recently; this substance. Each of the main characters in the film serve an important purpose, and have a defined arc. You care for them and you understand them. Take Magneto for example. Everyone who is familiar with the previous entries in the franchise, or with the comics as a whole, knows that Magneto is the villain of the series. This film seeks to flesh out this character, to understand why he goes in the direction he does. The movie goes beyond good and evil and examines the inner workings of a man abused since childhood. This is what makes the movie compelling. There are definitely plenty of cool special effects and big action sequences, but it is this attention to character that drives the film and keeps you invested in the events to come. Like I said, each of the characters serves a definite purpose. I really like that. The movie is about forming and training a team to combat villainy. In forming such a team you want it to be well-rounded. This is a good break from the previous films in the franchise, which were primarily shaped around Wolverine. He would hack and slash his way through the opposition then the rest of the X-men would work clean-up. I'm not knocking those films, but that is how they were constructed. It is also why First Class excels as a great comic book movie, even without Wolverine. The actors that bring these characters to life are all more than adequate for the job. 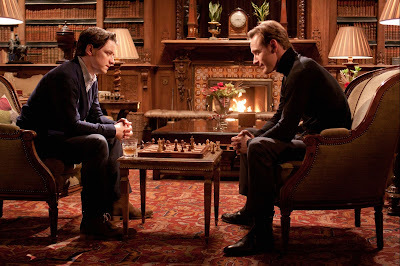 Michael Fassbender (Erik), James Macavoy (Charles), and Jennifer Lawrence (Mystique) give particularly stand-out performances. It baffles me how Fassbender hasn't rocketed to super-stardom yet as he has been consistently great in every role he's taken. You should also be on the lookout for some well-placed cameos and veteran character actors, like the great Michael Ironside, in secondary roles. Another aspect that helps the movie excel is Matthew Vaughn's execution of the well-conceived story. He had a lot to accomplish and did so thoroughly and economically. The movie simply covers a ton of ground both physically and narratively. First you're in Switzerland, then Argentina, then the U.S., then the arctic. You go to all of these places but you never feel like you're being jerked in one direction or another. Every transition is smooth and the reason for being there is coherent. Narratively, the film has to fit in with the comic book canon as well as the "future" movies in the franchise. As a long time X-Men fan, I found this incredibly satisfying. The movie is so full of references, winks, nods, and in-jokes that it almost demands a second look to catch every nuance. While it doesn't strictly follow X-Men canon, it is respectful of it and should be more than enough to please die-hard fans. I feel like I should also touch on the period aspect of the film and the phenomenol set design that sells it hook, line, and sinker. Everything from the clothing to the villain's super secret submarine lair draws you not only into a 60's era setting, but it is also distinctly comic book in appearance. It's a lot like Sean Connery era James Bond films, complete with larger than life villains. Only, instead of James Bond, you've got a guy that can manipulate metal with his mind. It's hard to come up with a film that has a similar feel to X-Men: First Class. It is unique in a number of ways. One thing that is definitely achieved was it rebooted a series spiraling the drain. It rebooted in the sense that it injected vitality into the series again, not "reboot" in new Hollywood jargon of completely restarting a series. The only movie that I can think of that would be similar is one of these "reboots", however. Batman Begins is the fulcrum between a dying series and one of the biggest movies in the last 20 years. It serves to re-establish the core characters in a more grounded, real-world setting. First Class isn't quite as gritty as Nolan's Batman franchise though. It instead opts for a delicate mixture of comic book tone and the gravity of reality. As Batman Begins lead to something greater, here is hoping First Class does the same. After Brett Ratner's ridiculous X-Men 3 I didn't think it was possible to sink any lower. Then along came the next movie in the series. X-Men Origins: Wolverine almost killed the whole franchise. I don't even remember the specifics of the story, I just remember wanting it to end. I was squirming in my seat at each bad joke and over the top explosion. It's a movie best forgotten, and I'm sorry I brought it up. First Class is bright enough to overcome this debacle and leave Origins behind as a bad memory. Thunderball is arguably one of the best Bond films. It's also the only one so far that worked well enough to actually remake it nearly twenty years later (Casino Royale doesn't count for a myriad of reasons). It was also one of the first of the series to dive head first into gadgets and assorted technologies designed by Q. This focus on special effects combined with the sixties setting and multiple underwater sequences make a it a perfect companion for X-Men: First Class. James Bond is as close to a super hero in this movie as he ever has been. He flies in the opening sequence! Definitely a good choice for a double feature, and a perfect place to start if you're looking to dive into the classic James Bond films.